So today I thought that I’d start off with another character building post. 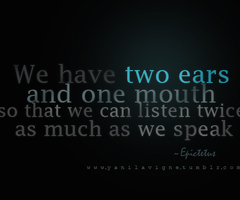 I was thinking about the importance of listening rather than being heard. My cell group at my church talked about this a couple of weeks ago and I started to do some self-reflection. I know that I have a habit of talking a lot, and when you have such a character trait such as I, you will realize how difficult it is to stop and be still and listen to what others are saying. This also happens when we pray as well but for this particular post I’m focusing on people relationships. I admit that I’m still a work in progress since I am aware of my general talkative behavioral tendencies so I’m not going to water this one down either just to sleep well at night. 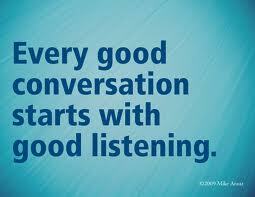 The nature of listening should be harnessed in order to build relationships. I believe that broken relationships are a result of poor communication and this is the reason why we need to hone in on the things that makes us become better at communicating with each other. By practicing effective communication, we learn how to maintain and build relationships and avoid unnecessary arguments that break up these relationships. This skill is required in your social, familial and business life. 4) To watch out for the meaning behind what is being said. There are reasons why I am bringing this up. I noticed that if we want to sharpen our discernment about people and make smart decisions about general issues in our social, familial and business lives, we have to focus on the basic things that we need to change in order to exercise sound judgement calls. Listening is a Skill that needs to be sharpened if you want to avoid making crazy mistakes that could have been avoided had you listened. Many times we make mistakes in our social lives because we don’t take the time to understand the full picture of a story that is being relayed to us and we jump to conclusions rashly because we haven’t sifted the meaning behind the words being spoken. Trust me, been there and done that. 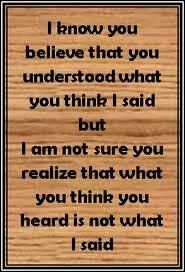 Listening will help us to develop effective communication to avoid misunderstandings. What types of listening skills do we have? 1.) 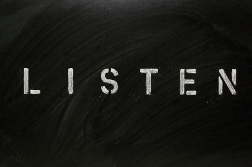 Attentive Listening – is a communication technique that requires the listener to understand, interpret, and evaluate what they hear. 2.) 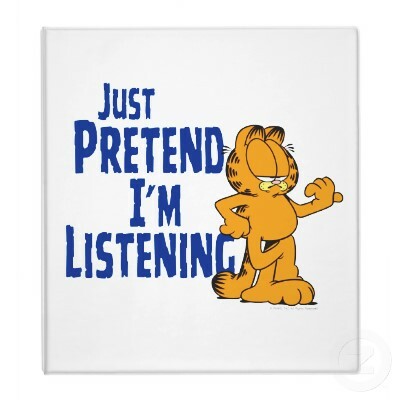 Selective Listening – This is when a person hears another but selects to not hear what is being said by choice or desire to hear some other message. This can take several forms and result in acting out in destructive ways. An example is to become passive aggressive by pretending to hear and agree to what was said when actually your intent is to NOT act on the message, but make the other person think you will. Another form is to act on what you wanted to hear instead of what was said. Continued selective listening is one of the best ways to destroy a relationship. 3.) Reflective Listening –is a communication strategy involving two key steps: seeking to understand a speaker’s idea, then offering the idea back to the speaker, to confirm the idea has been understood correctly. 4.) Competitive Listening –happens when we are more interested in promoting our own point of view than in understanding or exploring someone else’s view. We either listen for openings to take the floor, or for flaws or weak points we can attack. As we pretend to pay attention we are impatiently waiting for an opening, or internally formulating our rebuttal and planning our devastating comeback that will destroy their argument and make us the victor. 5.) 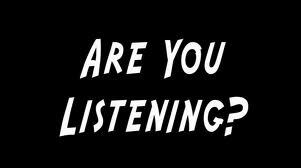 Ignore Listening – A type of false listening occurs where a person is pretending to listen but is not hearing anything that is being said. They may nod, smile and grunt in all the right places, but do not actually take in anything that is said. I’m pretty sure at some point in our lives we have been guilty of practicing some poor listening skills that I have listed here which may have contributed to serious misunderstandings. 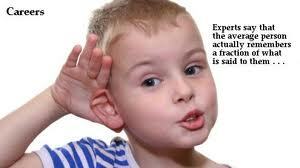 Many arguments that we have with our peers can be purely avoided had we perfected our listening abilities. 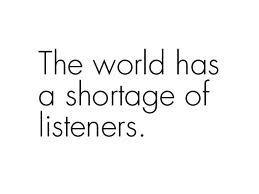 I am guilty of some of these poor listening skills and that is why I’m writing about it. We have to strive to master the art of attentive and reflective listening. If you want to be an effective communicator, you have to develop these specific skill sets. Ask yourself these questions, have you ever been in an argument with someone? What started the argument? What was the cause of the misunderstanding? Did you listen to what was said or were you busy competing to be heard? Seriously think about it and consider how your actions contribute to arguments and misunderstandings. The whole point of improving your listening skills is to gather information, analyze it and then make a sound judgement of what you understand by what was said. 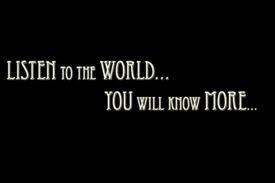 Those that compete to be heard as oppose to learning how to be attentive miss out basic information that leads to general misunderstandings. Being heard is not as important as listening to the meaning of what is being said. Watch for people’s body language as well as the tone of what they are saying. This is also necessary if you want to become better at discerning people and situations. 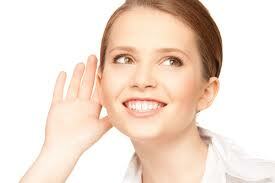 I think that to be an effective listener you have to learn to be an OBSERVANT Listener. The Observant Listener doesn’t just listen attentively and reflectively to what is being said. They also watch and look out for the tone and nuances found in a person’s body language to gauge what a person means behind what is being said, in order to understand what is being said by reading in between the lines of what is being said. Being observant requires you to make sense of what is being said by using your EYES and EARS to complete the meaning behind the words. You can solve many of your problems and other people’s problems by analysing their body language. 93% of human communication is based on non-verbal body language so it’s not enough to rely on just hearing what is being said because you have to take into consideration that words only comprise of 7% of our communication. You have to be an observant listener to communicate effectively and this will help you to sharpen your discernment level in order to make sound judgement calls. I must emphasize that this is necessary to sharpen your discernment level. If you talk a lot like I do, try sitting quietly when your with a group of people and listen attentively to the words being spoken. I found this really hard at times because sometimes I like to put my 2 cents into a situation. I have found that Humility is key here if you want to communicate effectively. Remember, it is not so important to be heard as it is to listen to what is being said. When you are competitive in a conversation you lose out on important information that could have been the defining point required to have been heard in order to make a sound judgement call. You can help people by listening attentively rather than passively. Learn to find meaning in what is being said to understand what is being said. If you don’t understand something that was spoken then ask questions in order to clarify a point. It is important to clarify what you do not understand so that you don’t remain confused about a specific point or you will end up believing something that is false. If you get half a picture, there is room for fallacy. You can get an inaccurate picture if people leave out information or if you fail to listen to the message in its entirety. 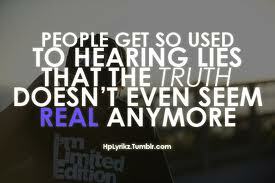 This is how some people end up believing in a LIE. Avoid these mistakes by taking the time to listen to EVERYTHING that is being said. You can weed out the truth of a message if you take the time to analyze the words spoken. Effective communication requires you to be an active observer and not a passive one. You can make great decisions in you life when you practice to listen attentively and reflectively. Last Note: Seek to understand in order to be understood. Listen attentively and don’t compete to be heard. Relationships are built by a MUTUAL UNDERSTANDING. I hope this will help you in your present relationships and will guide you to make better judgments in your life. Good post! I can honestly say I was at one time them kinda listners. Lets be honest im still at times. Ty for sharing! You never realize how hard this is until you try it. I have gotten pretty good at it, but I am still a competitive listener by far.